He came down just after 13:00 GMT on Saturday at Chanctonbury Ring, a prehistoric hill fort in West Sussex. The pilot called for help and was located by emergency crews about 40 minutes later. 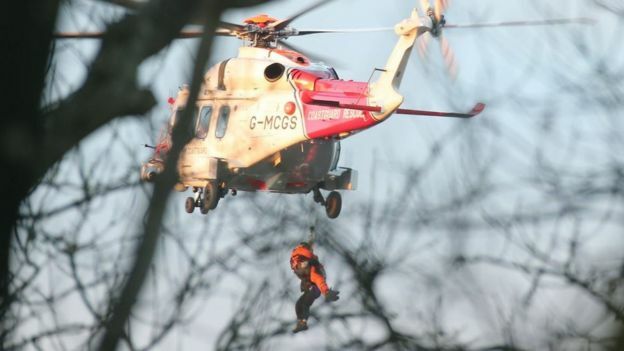 In a "challenging and protracted" rescue operation in ice and snow, he was finally winched to safety nearly four hours after the crash. Photojournalist Eddie Mitchell said the pilot was "happy and relieved" to be rescued. "Everyone was aware that in one minute, things could change instantaneously," he said. "If the plane had gone down, it would have changed the dynamics of the rescue." A Coastguard helicopter finally reached the pilot just before 16:40. West Sussex Fire and Rescue Service, police helicopters and the ambulance service were also involved.